University of Nebraska-Lincoln College of Law student Gatluak Ramdiet spent six years in a United Nations refugee camp after fleeing south Sudan in 2000. He interned at the U.N. in 2018. Gatluak Ramdiet was 9 years old, playing in the Nile River as he did many days, when the gunshots rang out. He and his brother dodged bullets as they ran. Ramdiet’s family was somewhat accustomed to violence, as civil war had been raging in Sudan for more than a decade, but now the militias were ambushing their village. Homes, crops and livestock were all burned or stolen. The small group joined a larger group heading east to a United Nations refugee camp in Ethiopia. Ramdiet’s parents and two younger sisters, who likely could not survive the journey, stayed behind. Once at the camp, Ramdiet was reunited with his eldest brother and his new sister-in-law. Food was scarce, and there was work to be done — Ramdiet and others would spend more than six hours a day walking to gather firewood to sell and trade for extra food and supplies, but he was still relieved to be in the camp. It was also the first time Ramdiet had access to education. “Unfortunately, we could only go for an hour twice a week, but I was glad to be learning,” he said. These opportunities had changed Ramdiet’s life, and he developed much respect for the U.N. workers at the camp and the programs that were assisting he and his brother, including the World Food Program and UNICEF. His eldest brother had applied for resettlement before Ramdiet arrived at the camp, and he petitioned for guardianship of his two younger brothers in order to be resettled together. Still, the family spent six years in the camp. Ramdiet recalls a years-long process of interviews, background checks and medical checks while awaiting resettlement. Finally, in 2006, they received word they would be resettling in the United States, with the aid of Lutheran Family Services. After a layover in New York City, they arrived in Omaha on March 26, 2006. With rudimentary English skills, and very little previous schooling, their transition in the U.S. wasn’t easy. Now 15, Ramdiet enrolled at Omaha South High School as a freshman. Ramdiet said his family was lucky to have teachers and mentors and their South Sudanese community to help them establish lives in Omaha. The brothers were also able to locate their family in Ethiopia and traveled there to visit in 2014. Ramdiet eventually earned his bachelor’s degree from the University of Nebraska at Omaha, and enrolled in the College of Law at the University of Nebraska-Lincoln in 2016. Ramdiet’s life came full circle while studying criminal and international law. Right away, he applied for an internship with the U.N., and wasn’t selected. The rejection stung, but an International Human Rights Seminar with Brian Lepard, Harold W. Conroy Distinguished Professor of Law, convinced him to try again. This time, Ramdiet had more knowledge about the U.N. and was able to better articulate what he could bring to and gain from the experience. Ramdiet was selected for an internship with the U.N.’s Office of Legal Affairs, thanks in part to the mentorship of Lepard and Eric Berger, associate dean for faculty and professor of law. 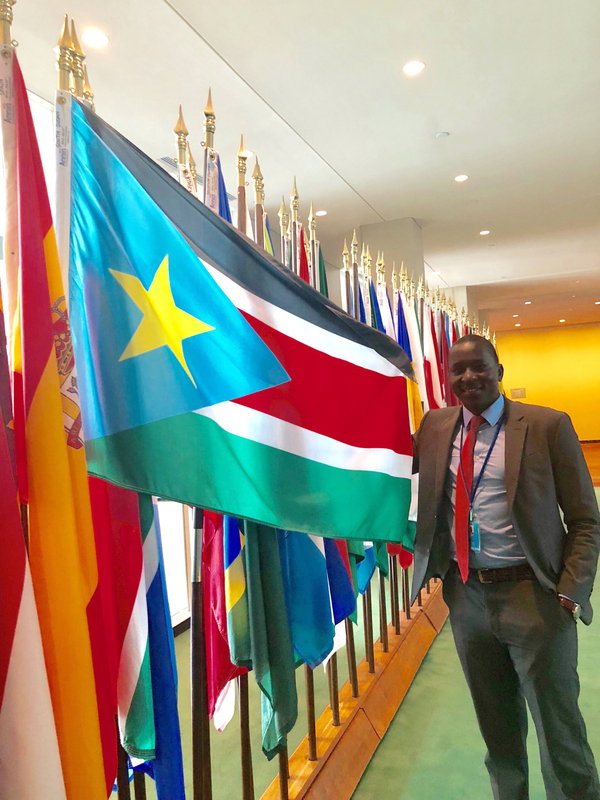 Ramdiet is photographed at the U.N. with the flag of his home country, South Sudan, which declared its independence in 2011. Ramdiet spent the summer of 2018 in New York working for the U.N., assisting with projects that exposed him to both international and domestic law. He also met the U.N. Secretary General who was the head of the refugee agency when Ramdiet was in the camp. While Nebraska will always be home, he said, he found that New York City suited him, too. He will be an assistant district attorney in New York City after he graduates in May and passes the bar exam in July. “My background is that of chaos, and that was caused by the absence of the rule of law,” Ramdiet said. “Those people in Sudan who burned our village and others still have not been prosecuted by anyone and that is something I live with every day because it changed my life.